Size: 2 sheets. Each is 37 x 48.5 cms. Title: 'Antiquae urbis Romae imago Accuratiss: EX VETVSTIS MONVMENTIS, EX VESTIGIIS VIDELICET AEDIFICIOR... from Civitates Orbis Terrarum, Latin text verso. A beautiful plan of ancient Rome. 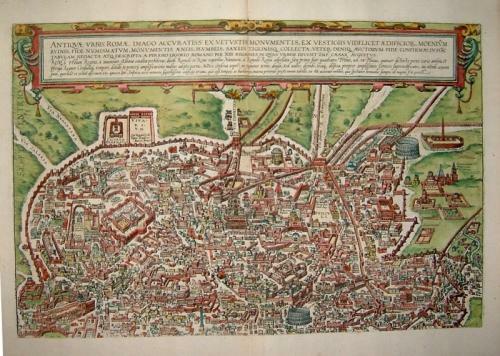 This great city atlas, edited by Georg Braun and largely engraved by Frans Hogenberg, eventually contained 546 prospects, bird-eye views and map views of cities from all over the world. Braun (1541-1622), a cleric of Cologne, was the principal editor of the work, and was greatly assisted in his project by the close, and continued interest of Abraham Ortelius, whose Theatrum Orbis Terrarum of 1570 was, as a systematic and comprehensive collection of maps of uniform style, the first true atlas. In very good condition. Margin slightly foxed, one sheet with small tear in the margin, three very little holes (two only just in the view, upper area, near center fold).